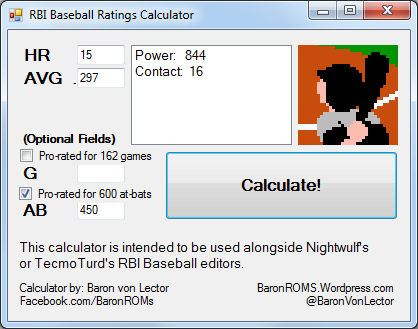 Putting my Visual Basic college classes to good use, I've created a calculator to help determine Batter ratings when putting together RBI Baseball ROMs. Using the data from the original RBI Baseball, I created a formula (seen here) to help determine Power and Contact ratings. The interface is simple. Enter a player's batting average. Enter a player's homeruns. Click Calculate. Keep in mind, this calculator is only for determining batting ratings. Running speed and pitching calculators will come, added to the batting calculator, at a later date. How do you differentiate between a guy who hits say 30 homeruns in 600 at bats or plate appearances and a guy who hits 30 homeruns in 300 at bats or plate appearances? While they both hit 30 homeruns, one guy hit 1 in every 20 at bats and the other hit 1 every 10 at bats. Just wondering if that was figured into the equation somehow. Awesome work by the way! Much thanks. That's something I'm going to feature in an update where you can input a player's at-bats and games, and then have it pro-rate for a 162-game season (if you choose). Right now, it's just straight up numbers, so Travis Story's 10 HR in 100 at-bats this season is the same as Steve Sax's 10 HR in 600+ AB in 1991. @TheFes75 I've updated the RBI Ratings Calculator to include the option to pro-rate a player's statistics over a 162 game or 600 at-bat season. Awesome job, now you can rate players on somewhat of an even keel especially for guys who have a better HR/per at bat ratio. This looks to be a way to capture when someone had a "magical" season like Dave Justice in 1990 was called up after about 35 games or so and had a big year in 3/4 of a season. He hit 282 with 28 Home Runs in 428 AB's. That would correlate to around 39 Home Runs over a 600 AB season. Would it be possible to map the 'select' button to be used in nes tsb? For example, for cycle backwards through receivers? This is the 2nd time now this has happened to me. I returned the first cartridge after it only worked for about an hour. After I put it in my NES and took it out 3-4 times to play other games it stopped working. Now the 2nd TSB17 I received does not work. I put it in played 2 games and now, in the middle of the game it randomly restarted itself. Now when I try to turn the game on, the cartage will not even start up, it just has a white line across the screen. The power button just flashes. My NES has a new 72 pin connector installed in it. I have over 80 NES original cartridges and I can randomly grab any 1 of the 80 games and they will work perfectly the first time. I put in any other of my NES carts they all start right up instantly with no issues. I put in the TSB17 and get a white line. Please let me know if this is a known problem and if there is a fix? I have looked everywhere on the net and cant find any information on the subject. I also see they have stopped selling the cartridge does this mean there are know problems with the cartridges? Knobbe - for this wonderful Website so the Tecmo players, and Tecmo people have somewhere to keep this game alive! To my many fans known and unknown, thanks for playing the ROM!" Scrolling cinema text now reads "DRUMMER'S NFL 2K13"
Screen between quarters where txt was "TECMO SPORTS NEWS" now reads "NFL GAME STATS"